A new NCHS Health E-Stat provides information on annual rates of all drug-poisoning deaths and drug-poisoning deaths involving opioid analgesics and heroin for 1999 through 2012 using data from the Centers for Disease Control and Prevention’s National Vital Statistics System. In 2012, there were 41,502 deaths due to drug poisoning (often referred to as drug-overdose deaths) in the United States, of which 16,007 involved opioid analgesics and 5,925 involved heroin. From 1999 through 2012, the age-adjusted drug-poisoning death rate nationwide more than doubled, from 6.1 per 100,000 population in 1999 to 13.1 in 2012. 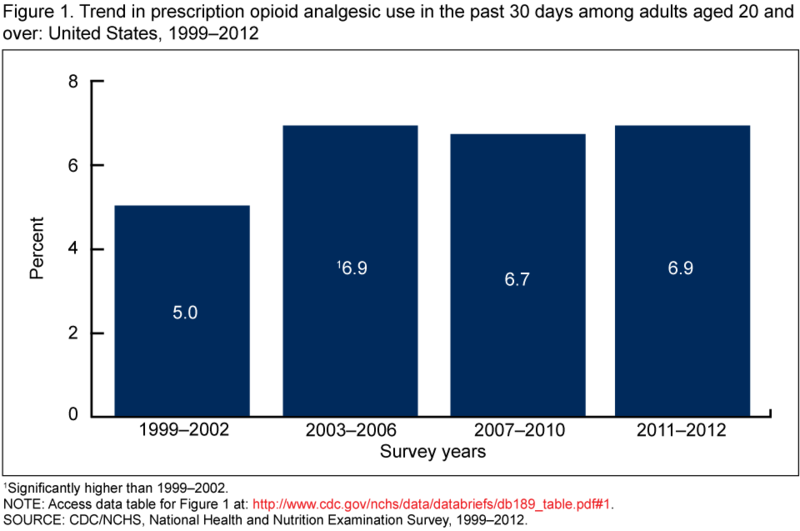 During the same period, the age-adjusted rates for drug-poisoning deaths involving opioid analgesics more than tripled, from 1.4 per 100,000 in 1999 to 5.1 in 2012. Opioid-analgesic death rates increased at a fast pace from 1999 through 2006, with an average increase of about 18% each year, and then at a slower pace from 2006 forward. The decline in opioid-analgesic death rates from 2011 through 2012, a decline of 5%, is the first decrease seen in more than a decade. 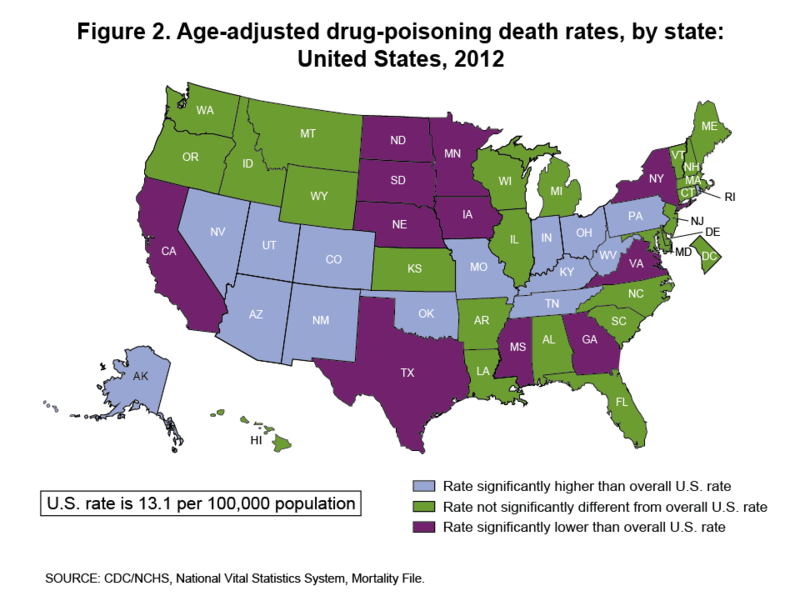 In 2012, 14 states had age-adjusted drug-poisoning death rates that were significantly higher than the overall U.S. rate. The states with the highest rates per 100,000 population were West Virginia (32.0), Kentucky (25.0), New Mexico (24.7), Utah (23.1), and Nevada (21.0). You are currently browsing the archives for the opioid category.